The United States Air Force (USAF) is the aerial and space warfare service branch of the United States Armed Forces. It is one of the five branches of the United States Armed Forces, and one of the seven American uniformed services. Initially formed as a part of the United States Army on 1 August 1907, the USAF was established as a separate branch of the U.S. Armed Forces on 18 September 1947 with the passing of the National Security Act of 1947. It is the youngest branch of the U.S. Armed Forces, and the fourth in order of precedence. 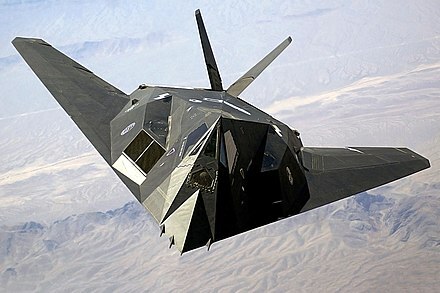 The USAF is the largest  and most technologically advanced  air force in the world. The Air Force articulates its core missions as air and space superiority, global integrated intelligence, surveillance, and reconnaissance, rapid global mobility, global strike, and command and control. Space warfare is combat that takes place in outer space. 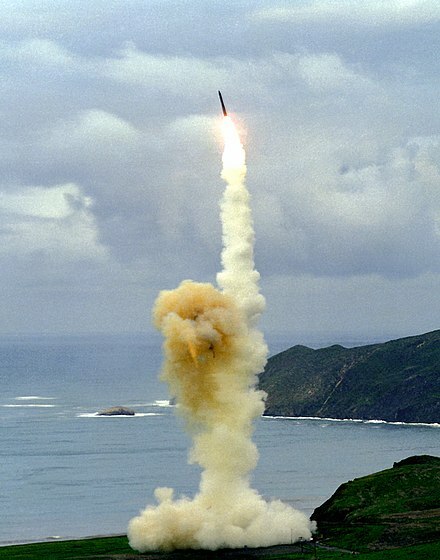 The scope of space warfare therefore includes ground-to-space warfare, such as attacking satellites from the Earth, as well as space-to-space warfare, such as satellites attacking satellites. 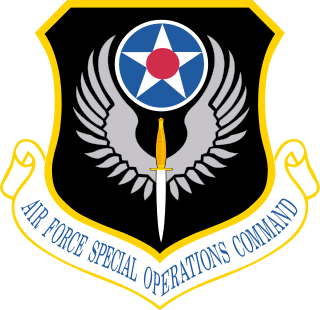 The Department of the Air Force (DAF) is one of the three Military Departments within the Department of Defense of the United States of America. The Department of the Air Force was formed on September 18, 1947, per the National Security Act of 1947 and it includes all elements and units of the United States Air Force (USAF). 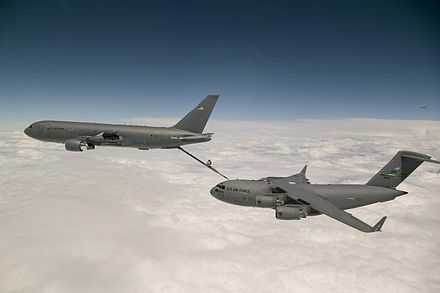 Along with conducting independent air and space operations, the U.S. Air Force provides air support for land and naval forces and aids in the recovery of troops in the field. As of 2017 [update] , the service operates more than 5,369 military aircraft, 406 ICBMs and 170 military satellites. It has a $161 billion budget and is the second largest service branch, with 321,444 active duty airmen, 141,800 civilian personnel, 69,200 reserve airmen, and 105,700 Air National Guard airmen. A military satellite is an artificial satellite used for a military purpose. 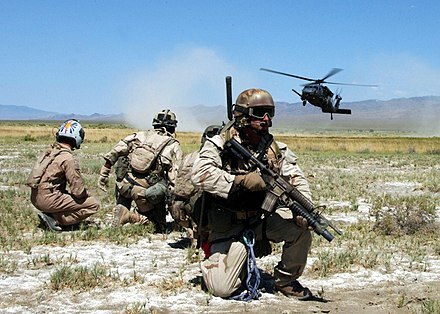 The most common missions are intelligence gathering, navigation and military communications. The first military satellites were photographic reconnaissance missions. Some attempts were made to develop satellite based weapons but this work was halted in 1967 following the ratification of international treaties banning the deployment of weapons of mass destruction in orbit. As of 2013, there are 950 satellites of all types in Earth orbit. It is not possible to identify the exact number of these that are military satellites partly due to secrecy and partly due to dual purpose missions such as GPS satellites that serve both civilian and military purposes. As of December 2018 there are 320 military or dual-use satellites in the sky, half of which are owned by the USA, followed by Russia, China and India (13). Although provision is made in Title 10 of the United States Code for the Secretary of the Air Force to appoint warrant officers, the Air Force does not currently use warrant officer grades, and is the only one of the U.S. Armed Services not to do so. The Air Force inherited warrant officer ranks from the Army at its inception in 1947. The Air Force stopped appointing warrant officers in 1959,  the same year the first promotions were made to the new top enlisted grade, Chief Master Sergeant. Most of the existing Air Force warrant officers entered the commissioned officer ranks during the 1960s, but small numbers continued to exist in the warrant officer grades for the next 21 years. The last active duty Air Force warrant officer, CWO4 James H. Long, retired in 1980 and the last Air Force Reserve warrant officer, CWO4 Bob Barrow, retired in 1992. Upon his retirement, he was honorarily promoted to CWO5, the only person in the Air Force ever to hold this grade. Since Barrow's retirement, the Air Force warrant officer ranks, while still authorized by law, are not used. The USAF is the only branch of the U.S. military where NCO status is achieved when an enlisted person reaches the pay grade of E-5. In all other branches, NCO status is generally achieved at the pay grade of E-4 (e.g., a Corporal in the Army  and Marine Corps, Petty Officer Third Class in the Navy and Coast Guard). 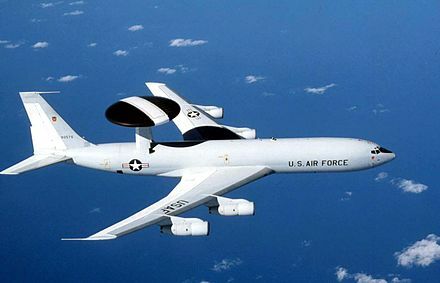 The Air Force mirrored the Army from 1976 to 1991 with an E-4 being either a Senior Airman wearing three stripes without a star or a Sergeant (referred to as "Buck Sergeant"), which was noted by the presence of the central star and considered an NCO. Despite not being an NCO, a Senior Airman who has completed Airman Leadership School can be a supervisor according to the AFI 36-2618. The first USAF dress uniform, in 1947, was dubbed and patented "Uxbridge Blue" after "Uxbridge 1683 Blue", developed at the former Bachman-Uxbridge Worsted Company. The current Service Dress Uniform, which was adopted in 1994, consists of a three-button, pocketless coat, with silver "U.S." pins on the lapels for officers or with a silver ring surrounding on those of enlisted Airmen, matching trousers, and either a service cap or flight cap, all in Shade 1620, "Air Force Blue" (a darker purplish-blue). This is worn with a light blue shirt (Shade 1550) and Shade 1620 herringbone patterned necktie. Enlisted Airmen wear sleeve rank on both the jacket and shirt, while officers wear metal rank insignia pinned onto the epaulet loopson the coat, and Air Force Blue slide-on epaulet loops on the shirt. USAF personnel assigned to Base Honor Guard duties wear, for certain occasions, a modified version of the standard service dress uniform, but with silver trim on the sleeves and trousers, with the addition of a ceremonial belt (if necessary), service cap with silver trim and Hap Arnold Device, and a silver aiguillette placed on the left shoulder seam and all devices and accoutrement. 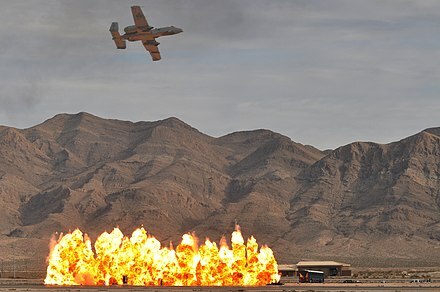 The attack aircraft  of the USAF are designed to attack targets on the ground and are often deployed as close air support for, and in proximity to, U.S. ground forces. 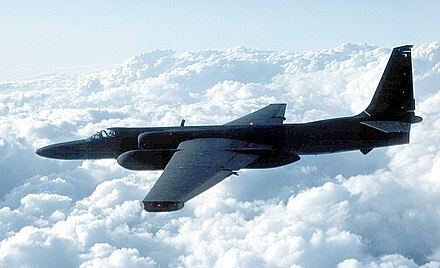 The proximity to friendly forces require precision strikes from these aircraft that are not always possible with bomber aircraft. Their role is tactical rather than strategic, operating at the front of the battle rather than against targets deeper in the enemy's rear. 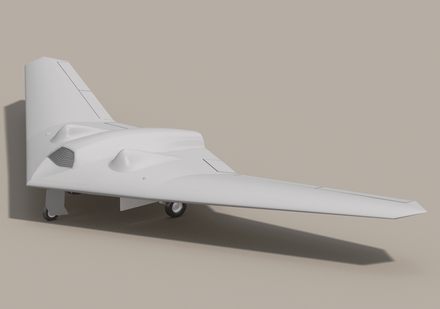 The Air Force is currently running the OA-X experiment, with the intent to procure an off-the-shelf light attack aircraft. 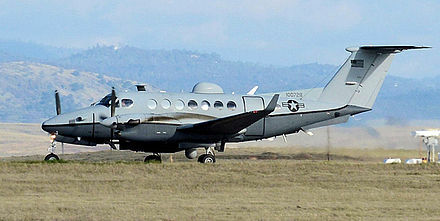 Current USAF attack aircraft are operated by Air Combat Command, Pacific Air Forces, and Air Force Special Operations Command. Many of the U.S. Air Force's formal and informal traditions are an amalgamation of those taken from the Royal Air Force (e.g., dining-ins/mess nights) or the experiences of its predecessor organizations such as the U.S. Army Air Service, U.S. Army Air Corps and the U.S. Army Air Forces. Some of these traditions range from "Friday Name Tags" in flying units to an annual "Mustache Month". The use of "challenge coins" dates back to World War I when a member of one of the aero squadrons bought his entire unit medallions with their emblem,  while another cultural tradition unique to the Air Force is the "roof stomp", practiced by Airmen to welcome a new commander or to commemorate another event, such as a retirement. The Second Air Force is a USAF numbered air force responsible for conducting basic military and technical training for Air Force enlisted members and non-flying officers. In World War II the CONUS unit defended the Northwestern United States and Upper Great Plains regions and during the Cold War, was Strategic Air Command unit with strategic bombers and missiles. Elements of Second Air Force engaged in combat operations during the Korean War; Vietnam War, as well as Operation Desert Storm. The Air Force Specialty Code (AFSC) is an alphanumeric code used by the United States Air Force to identify a specific job. Officer AFSCs consist of four characters and enlisted AFSCs consist of five characters. A letter prefix or suffix may be used with an AFSC when more specific identification of position requirements and individual qualifications is necessary. The AFSC is similar to the Military Occupational Specialty Codes used by the United States Army and the United States Marine Corps or enlisted ratings and USN officer designators used by the United States Navy and enlisted ratings and USCG officer specialties used by the United States Coast Guard. United States Air Force Security Forces is the force protection and military police of the United States Air Force. Security Forces (SF) were formerly known as Military Police (MP), Air Police (AP), and Security Police (SP). 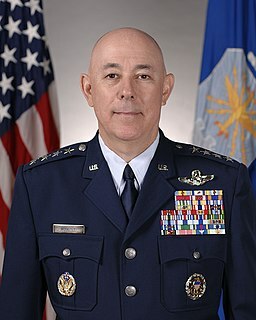 Teed Michael "Buzz" Moseley is a retired United States Air Force general who served as the 18th Chief of Staff of the United States Air Force. He is a fighter pilot with more than 3,000 flight hours in fighters and trainers, most in the F-15 Eagle. The Colorado Air National Guard is the aerial militia of the U.S. State of Colorado. It is, along with the Colorado Army National Guard, an element of the Colorado National Guard. 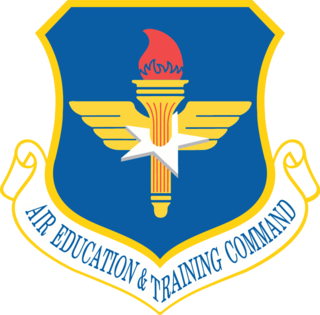 The units of the Colorado Air National Guard are not in the normal United States Air Force chain of command. They are under the jurisdiction of the Governor of Colorado through the office of the Colorado Adjutant General unless they are federalized by order of the President of the United States. The Colorado Air National Guard is headquartered in Centennial, and its commander is currently Major General H. Michael Edwards. 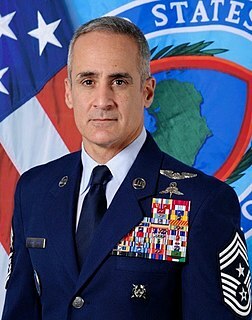 Command Chief Master Sergeant Ramón Colón-López is a pararescueman with the U.S. Air Force. In 2007 he was the only Hispanic American amongst the first six airmen to be awarded the newly created Air Force Combat Action Medal. He is currently the Senior Enlisted Leader of United States Africa Command. ↑ "AF Branding & Trademark Licensing". www.trademark.af.mil. Archived from the original on 4 July 2018. Retrieved 5 April 2019. ↑ "Department of Defense (DoD) Releases Fiscal Year 2017 President's Budget Proposal". 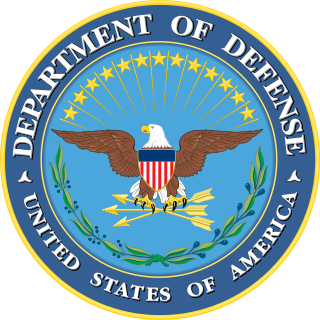 U.S. Department of Defense. 9 February 2016. Archived from the original on 16 February 2016. Retrieved 11 February 2016. ↑ "World Air Forces 2018". Flightglobal: 17. Archived from the original on 14 June 2018. Retrieved 13 June 2018. 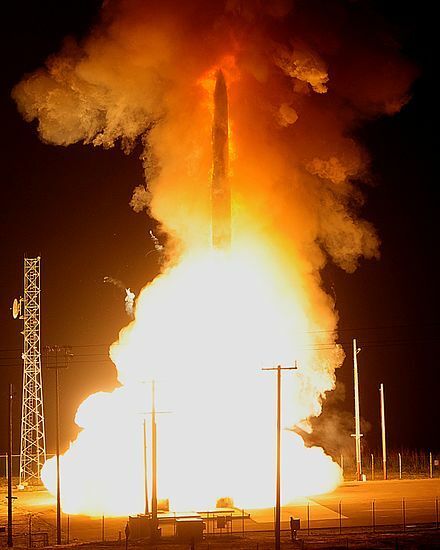 ↑ "Air Force Arsenal of Land-Based Nukes Shrinking as Planned". Associated Press. 20 March 2017. Archived from the original on 19 March 2017. Retrieved 20 March 2017. 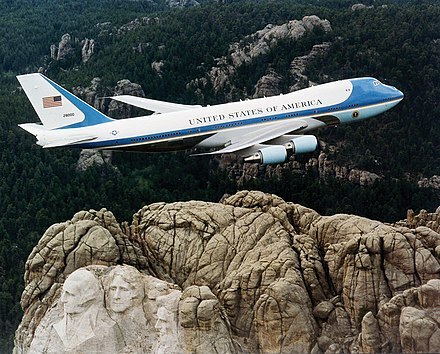 ↑ "AF 101" (PDF). Archived (PDF) from the original on 23 May 2017. Retrieved 18 September 2017. ↑ "Aim High ... Fly-Fight-Win to be Air Force motto USAF". United States Air Force. 7 October 2010. Archived from the original on 9 January 2018. Retrieved 19 October 2010. ↑ "Ventura" (PDF). Archived (PDF) from the original on 29 August 2017. Retrieved 5 April 2019. ↑ "The Air Force Flag" (PDF). Air Force Historical Research Agency. United States Air Force. 24 March 2007. Archived from the original (PDF) on 2 September 2013. Retrieved 7 August 2017. ↑ "these-are-worlds-largest-air-forces". newsweek.com. Archived from the original on 5 September 2018. Retrieved 5 September 2018. 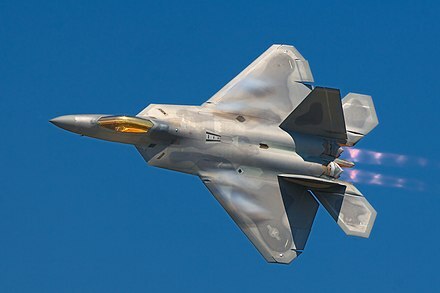 ↑ "pentagon-f-22-raptor-f-35-upgrades". cnn.com. Archived from the original on 5 September 2018. Retrieved 5 September 2018. ↑ "10 USC 8062". Law.cornell.edu. 1 October 2009. Retrieved 30 August 2010. 1 2 "About Us". www.af.mil. Archived from the original on 30 December 2018. Retrieved 30 December 2018. ↑ "Defense bill would make key changes in space command but stop short of new branch". Archived from the original on 1 December 2017. Retrieved 28 November 2017. ↑ "The Army Air Forces in World War II Volume VI: Men and Planes: Chapter 2". www.ibiblio.org. Archived from the original on 28 October 2017. Retrieved 8 November 2017. 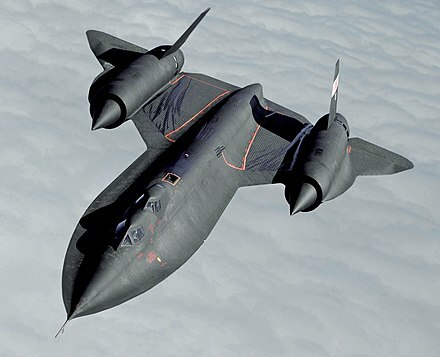 ↑ "The Air Force Fact Sheet" Archived 8 December 2014 at the Wayback Machine . U.S. Air Force. Retrieved 30 December 2014. ↑ U.S. Department of State. 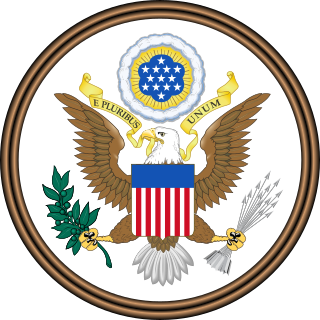 National Security Act of 1947 Archived 27 July 2013 at the Wayback Machine . Retrieved 3 October 2010. ↑ Wildsmith, Snow (2012). Joining the United States Air Force. United States of America: McFarland. p. 56. ISBN 978-0-7864-4758-9. Archived from the original on 4 September 2015. ↑ Bennett, John T. "Panetta Selects Trusted Hand for New Air Force Chief." Archived 29 June 2017 at the Wayback Machine U.S. News & World Report, 14 May 2012. ↑ "Air Force Basic Military Training – Home". af.mil. Archived from the original on 8 April 2015. Retrieved 1 April 2015. 1 2 Needed: 200 New Aircraft a Year Archived 20 January 2013 at the Wayback Machine , Air Force Magazine, October 2008. ↑ "Air Force Magazine". wayback.archive-it.org. Archived from the original on 24 May 2017. ↑ Maj. Timothy Farr. "Airmen's time tour makes follow-up visits". Af.mil. Archived from the original on 18 July 2012. Retrieved 30 August 2010. 1 2 "The Gates Case" (PDF) (July 2008). Air Force Magazine. Air Force Magazine. July 2008. Archived (PDF) from the original on 23 November 2016. Retrieved 22 November 2016. ↑ "Washington watch" Archived 20 January 2013 at the Wayback Machine , AIR FORCE Magazine, July 2008, Vol. 91 No. 7, pp. 8. ↑ Chavanne, Bettina H. "USAF Creates Global Strike Command" Archived 11 January 2012 at the Wayback Machine . Aviation Week, 24 October 2008. 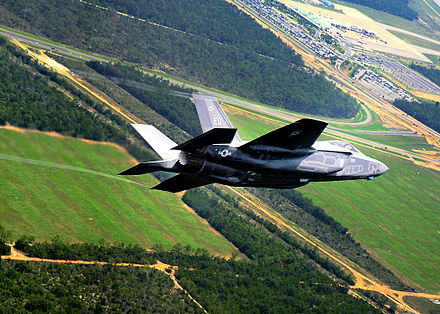 ↑ "Plan reshapes U.S. air power". Airforcetimes.com. Retrieved 30 August 2010. ↑ Gerry J. Gilmore. 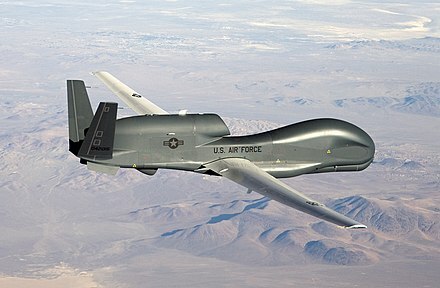 "Unmanned aircraft take on increased importance". Af.mil. Archived from the original on 29 July 2012. Retrieved 30 August 2010. ↑ 7 October 2009— (7 October 2009). "Future U.S. Defense Needs in a High Technology Present – Up Front Blog – Brookings Institution". Brookings.edu. Archived from the original on 26 October 2010. Retrieved 30 August 2010. 1 2 "Air Force Pamphlet 36-2241" [ dead link ]. USAF, 1 July 2007. 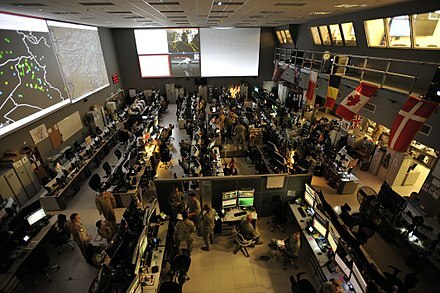 ↑ "USAF to help transport French troops to Mali". airforcetimes.com. Retrieved 1 April 2015. ↑ "Yesterday's Air Force: Operation Tomodachi". U.S. Air Force. Archived from the original on 8 July 2018. Retrieved 5 April 2019. ↑ "What Is the Organizational Structure of the Air Force?". the balance. Archived from the original on 10 November 2017. Retrieved 31 December 2017. ↑ "2007 USAF Almanac: Major Commands" (PDF). AIR FORCE Magazine. Archived from the original (PDF) on 16 February 2008. Retrieved 9 February 2008. ↑ "Civil Air Patrol joins total force 'Airmen' > U.S. Air Force > Article Display". Af.mil. Archived from the original on 16 October 2015. Retrieved 14 October 2015. ↑ "2007 USAF Almanac: USAF Squadrons By Mission Type" (PDF). AIR FORCE Magazine. Archived from the original (PDF) on 1 December 2007. Retrieved 9 February 2008. ↑ "Air Force Specialty Code Information" (PDF). United States Air Force. July 2008. Archived from the original (PDF) on 9 September 2008. ↑ "Enlisted Air Force Ranks". Military.com. Military.com. Archived from the original on 19 November 2016. Retrieved 22 November 2016. ↑ "Air Force Officer Ranks". Military.com. Military.com. Archived from the original on 22 November 2016. Retrieved 22 November 2016. ↑ "Five Star Generals and Admirals of the United States". The History Guy. The History Guy. Archived from the original on 23 November 2016. Retrieved 22 November 2016. ↑ Schwellenbach, Nick. 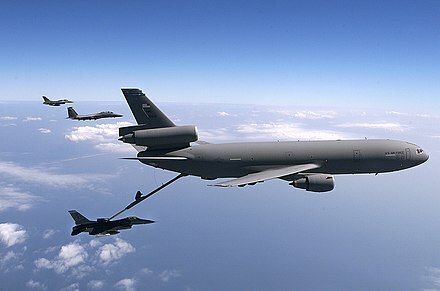 "Brass Creep and the Pentagon: Air Force Leads the Way As Top Offender." Archived 3 March 2016 at the Wayback Machine POGO, 25 April 2011. 1 2 "Warrant Officer Programs of Other Services". United States Army Warrant Officer Association. Archived from the original on 30 December 2006. Retrieved 18 March 2007. ↑ "Warrant Officers of the US Military". Militaryranks.us. 16 November 2006. Archived from the original on 18 June 2010. Retrieved 30 August 2010. ↑ "Department of Defense Enlisted Rank Insignias". Defenselink.mil. Archived from the original on 17 June 2008. Retrieved 30 August 2010. ↑ "Getting the Blues, by Tech. Sgt. Pat McKenna". Air Force Link. Archived from the original on 2 February 2007. Retrieved 24 September 2007. ↑ "Air Force transitions to a single combat uniform". U.S. Air Force. Archived from the original on 17 July 2018. Retrieved 5 April 2019. 1 2 "USAF Almanac, The Air Force in Facts and Figures" (PDF). Air Force Magazine. May 2013. Archived (PDF) from the original on 11 December 2013. Retrieved 2 August 2013. ↑ "B-1B Bombers Are The Aerial Weapon of Choice For Supporting Iraq's Ramadi Offensive". Archived from the original on 16 August 2017. Retrieved 16 August 2017. ↑ Gorrell, Mike. 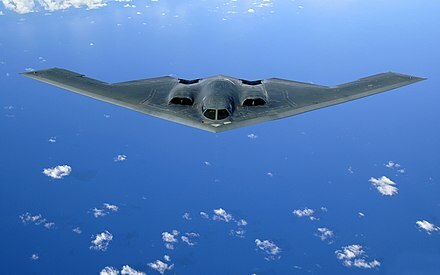 "Northrop Grumman celebrates bomber contract in Utah". The Salt Lake Tribune. Archived from the original on 31 January 2016. ↑ "Photos: Airtech CN-235 Aircraft Pictures". Airliners.net. 23 December 2004. Archived from the original on 5 May 2009. Retrieved 30 August 2010. ↑ "Air Force Culture and Conventional Strategic Airpower". Stormingmedia.us. Archived from the original on 29 June 2011. Retrieved 30 August 2010. ↑ Thompson, Mark (8 July 2013). "The Air Force's Future May Be in Drones, But Its Generals Won't Be". Time. Archived from the original on 12 July 2013. Retrieved 8 July 2013. ↑ Worden, Michael (November 1997). "The Rise of the Fighter Generals". dtic.mil. Air University Press. Retrieved 12 March 2014. ↑ Barnes, Julian E.; Spiegel, Peter (10 June 2008). "A different type of Air Force leader". Los Angeles Times. Archived from the original on 25 May 2017. Retrieved 30 August 2010. ↑ Jaffe, Greg (27 February 2010). "Combat Generation: Drone operators climb on winds of change in the Air Force". The Washington Post. Archived from the original on 16 June 2012. Retrieved 30 August 2010. ↑ Everstine, Brian (29 January 2014). "James: AF is addressing 'systemic' problem in nuclear force". airforcetimes.com. Gannett Government Media. Retrieved 29 January 2014. ↑ Magruder, Jr., Daniel L. (2009). "The US Air Force and Irregular Warfare: Success as a Hurdle" (PDF). Small Wars Journal. Archived (PDF) from the original on 4 March 2016. Retrieved 15 October 2015. ↑ "Understanding Airmen: A primer for soldiers" (PDF). Archived (PDF) from the original on 11 January 2012. Retrieved 13 December 2011. 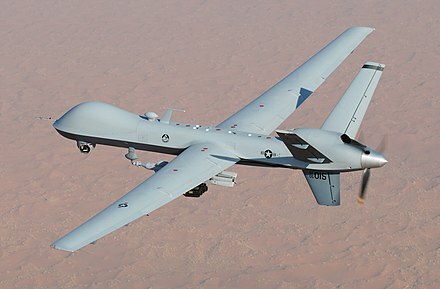 ↑ "US Air Force Lacks Volunteers To Operate Drones". Defense News. Retrieved 1 April 2015. ↑ Whitlock, Craig (13 November 2013). "Drone combat missions may be scaled back eventually, Air Force chief says". The Washington Post. Archived from the original on 28 July 2014. Retrieved 14 May 2014. ↑ Wasserbly, Daniel (12 May 2014). "AUVSI 2014: USAF looking to refine RPA training regime, reduce accidents". janes.com. IHS Jane's Defence Weekly. Archived from the original on 14 May 2014. Retrieved 14 May 2014. ↑ Cox, Matthew (24 April 2014). "Air Force Criticized for Mismanaging Drone Program". military.com. A Monster Company. Archived from the original on 28 July 2014. Retrieved 14 May 2014. ↑ Scharre, Paul (29 July 2014). "How to Lose the Robotics Revolution". warontherocks.com. War on the Rocks. Archived from the original on 29 July 2014. Retrieved 29 July 2014. ↑ "A Brief History of Challenge Coins". 26 September 2012. Archived from the original on 24 January 2018. Retrieved 24 January 2018.